The title of this post was taken from the song Fireworks by Katy Perry. I've talked about my niece Mikayla quiet a bit, remember my posts talking about our trip to Florida in 2011. No, well you can find them here and here. 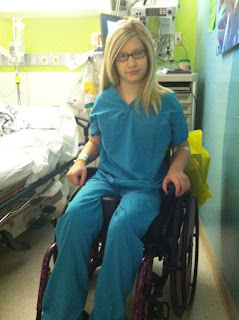 Mikayla is my beautiful 13 year old niece who happens to have cerebral palsy. There are not enough words to describe her and how incredible she is. What never fails to amaze me is not only her strength but how Mandaly, my sister, has poured every bit of herself into making sure Mikayla has as many experiences in life as she can. Nothing stops this child from accomplishing something that she wants to do. I am lucky to be the aunt of this wonderful young lady. Mikayla had surgery today, she had bilateral adductor tendon releases...yes people that is what Google was made for, research it if you want details. I went to see Kayla last night. Here was part of our conversation. "A little bit. It's my sixth surgery." "That makes you a pro at this doesn't it." Tyler missed school today to be with her BFF. There is no place she would rather be. I made Mandaly and Mikie promise to text me throughout the day and give me updates. 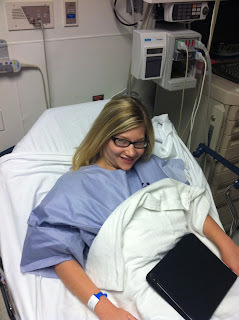 Mikie sent me this picture of Kayla before she went into surgery. "Bravest kid on the planet!" Later Mandaly sent me these pictures. 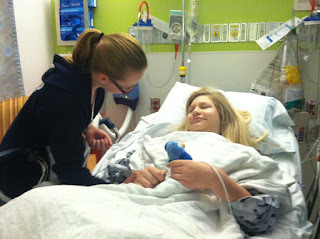 Mikayla about an hour after surgery. That's right people I said an hour after surgery! Seriously she is like super girl or something! Next came this text from Mandaly. Ok, I just don't want the hard stuff." I couldn't help but cry as I read that text. There is no denying Mikayla is beautiful both inside and out. If you don't have the pleasure of knowing her personally you can get a glimpse into her life by checking out one of her videos here. Seriously she is such an amazing young lady and a daily inspiration to everyone she meets. You'll be glad you watched it.